you are able to feel the effects of the practice in your everyday life. From the first yoga class I took, I knew this was something I would do for the rest of my life. As time has gone on, my practice has changed. It is nothing like the practice that I first started out doing. I have changed, and with that change my practice has evolved. Yoga helps us to move through our life changes with grace. Yoga means union. You may have heard that many times before., or this may be the first time you are hearing this. Regardless, the main gist of this practice is to connect with self. This practice calms the mind, creates health and helps you feel more comfortable in your physical body. It is by far, the most all encompassing activity that you can do for your body, mind, spirit at one time. 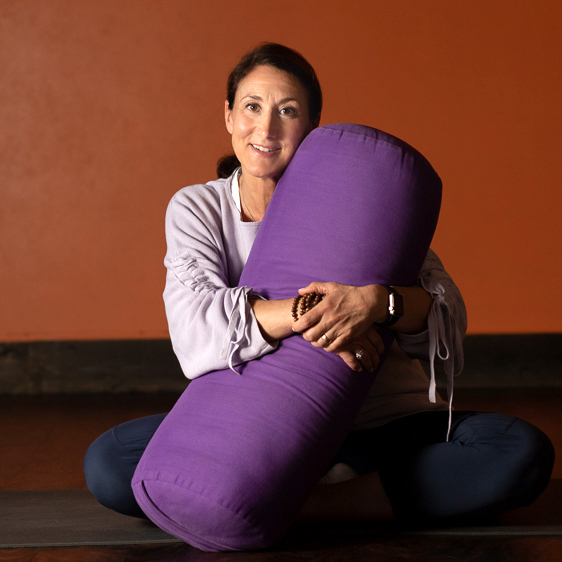 Gail Boorstein Grossman, E-RYT-500, CYKT, teaches you how to practice Restorative yoga—a form of yoga that focuses on physical and mental relaxation through poses aided by props. It’s a gentle yet empowering style that helps you de-stress and re-energize. While Restorative yoga is beneficial for your entire body, Gail also shows you how to treat more than twenty ailments, such as headaches, digestive issues, and anxiety, through specific yoga poses and sequences. Guided by step-by-step instructions and beautiful photographs, you will gently ease your way into inner calm and better health with powerful yoga sequences.